It was such a nice day yesterday afternoon (if a bit windy...) and after we treated ourselves to that tasty cake, we thought we would zip downtown and take a walk around the lake with Gus. Lake Calhoun is usually our lake of choice, but it was very crowded with the warm sun bringing everyone out of the woodwork. 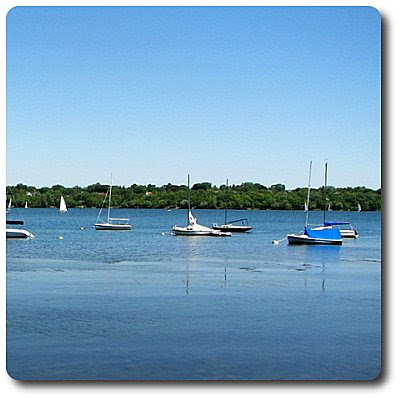 So, just a mile away is another lake we like, Lake Harriet! The trail around this one is a little more secluded with trees and whatnot, but it has some outstanding views and crazy expensive homes surrounding it to gawk at. After looking back over this past week, we prepared 6 new recipes with the following as our favorites - Dark Chocolate Cookies with Espresso, Grape and Rosemary Focaccia and Sour Cream-Hazelnut Bundt Cake. I mentioned to Jeff the other day that I've really had a hankering for a pot of chili, fully expecting him to say "it's too warm out - you are crazy! ", but he came back with "Get out! Me too... it may be warm outside, but it sounds so good!". 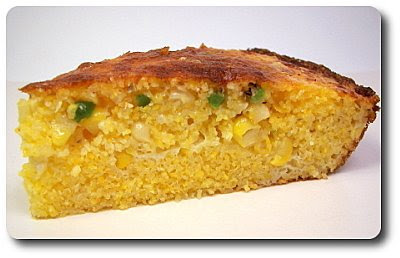 Ok , the main dish was set then - but I figured we might as well go all out and make a batch of this Spicy Jalapeño Corn Bread to go along side! This is a recipe that you'll want to dig down in your pantry to pull out the coarser stone-ground cornmeal, rather than the typical fine cornmeal you might want to use, to give this bread some toothsome texture. To reinforce the corn aspect, we mixed sweet kernels stripped right off the cob (you'll need about two ears of corn to get the amount needed) into the mix, along with baking soda for lift and enough salt to highlight the subtle flavors. To get those dry ingredients lubed up, tangy butter milk was combined with shreds of white cheddar, melted butter, a couple spoonfuls from our favorite jar of (lavender) honey, a touch of oil and a couple eggs to create the liquid works. For a spicy kick, we also tossed in a minced jalapeño, seeds and all - you can remove those if you like, but we didn't find it necessary (see a little later why). When you that batch into the dry ingredients, the batter may look fairly loose and thin - however, this is what you want as the larger grains of cornmeal just take a little longer to absorb all that liquid. Instead of spooning the batter into a cold pan, we set our cast-iron skillet into the oven and gave it a few minutes to heat up while empty. The batter is then poured in when the skillet is hot, allowing the batter to be attacked on all sides, giving it a head start. Half an hour later, the bread tested done and I immediately noticed how much more color the bread achieved! Patience does come into play now as you'll want to let the bread rest at least ten minutes before you anxiously slide your knife in to cut yourself out a wedge. 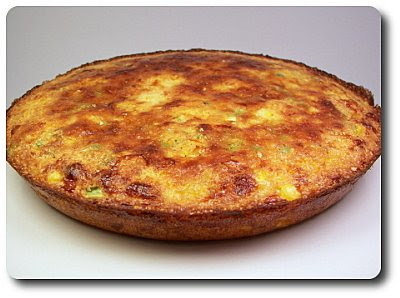 With a richly golden brown crust (go pre-heated skillet! ), the inside of this bread remained quite moist with a light tang from that pertinent buttermilk. The shreds of cheese melted into the bread, building in sharp waves throughout each bite, while that sticky honey added just the right kiss of sweetness without making the bread taste like dessert. That jalapeño? Well, the original recipe called for pickled jalapeños, which might have made a difference, but I just used a fresh one and even with those ribs and seeds, it didn't have as much of a spicy kick as we hoped for. However, it did have a whisper of heat, which was enough to keep us happy! 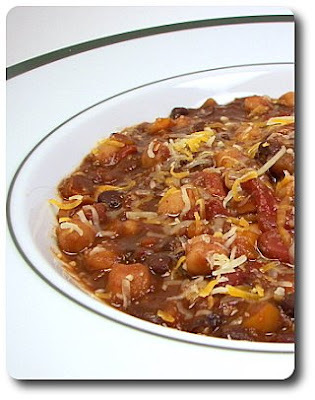 For an intriguing twist, we decided to go into the meatless realm for the chili dish tonight with this Smoky Three-Bean Chili with Cocoa. To give this a hearty vegetable base, heaping mounds of chopped onion, bright orange bell peppers and red bell peppers were tossed into our trusty Dutch oven to soften in hot canola oil. Chili powder and cumin, along with a tablespoon of the special ingredient, cocoa powder, were sprinkled over the vegetables and allowed contact with the heat to quickly toast and develop each of their unique qualities. While the chili powder and cumin added their own smokiness, to add in a more pungent layer, a chopped chipotle chili (you know, those smoked jalapeños packed in adobo sauce) was tossed into the pot as well. Instead of using water or a combo of broth and water as the liquids, we used a combination of vegetable broth and a beer to add to the interesting and slightly more complex direction we were headed. Use whichever trio of beans you like, but we used what always has a home in our pantry - black beans, chickpeas and red kidney. To incorporate a tomato essence, fire-roasted diced tomatoes went into the mix just before we left the pot on the stove to bubble away for a good forty-five minutes. While the chili had thickened slightly after that time, we were aiming for it to be a little tighter and not quite as soupy. After a small scoop of stone-ground cornmeal and a five minute simmer later, the chili was where we wanted it and out came the serving bowls! Once portioned out, I asked Jeff if he wanted any toppers and after a quick spoonful to taste, all he wanted was a sprinkling of cheese! The cocoa in this chili doesn't come across as tasting like there was hunks of chocolate melted in, but its bitterness brought a contrasting depth to the sweetness in the tomatoes and onions that is worth trying if you've never added it before. 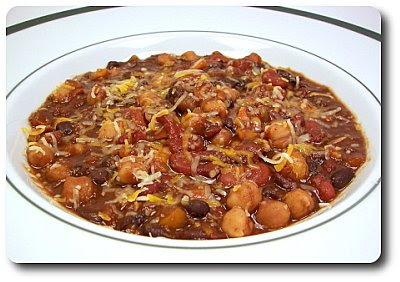 While adding to the smoky aspect, the chipotle in this filling chili gave us a robust heat that was enough to for a pleasant burn as it went down, but not so much that it overtook the subtle flavors. Did we miss the meat? I thought we might, well, especially Jeff, but in fact he took the time to make sure that this didn't fall into the void of already tried recipes and was placed in a spot where we would remember to make this again soon! I usually save cakes to make for those Weekly Wednesday Treat Days or for a special event, but I couldn't get the idea out of my head this morning and decided we needed a cake today just because! I peeked into the pantry to see what I had on hand, then went through my pile of cake recipes to see what matched. I initially had a layer cake in mind, but then didn't feel like dealing with a frosting. 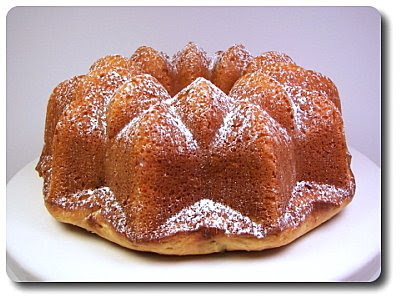 This narrowed down my choices pretty quick and once I whittled those out, I ended up deciding on this Sour Cream-Hazelnut Bundt Cake! 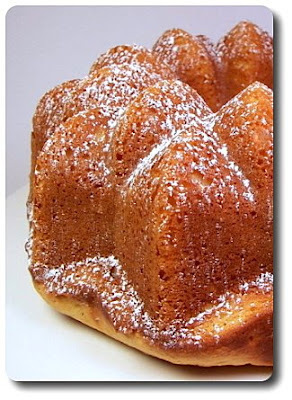 To get the batter prepared for this cake, classic ingredients like butter and sugar were beaten together until the color had lightened and the mixture was fluffy. When you add in the eggs, drop them in one at a time and fully incorporate each before you continue on - while this is good to get the eggs completely entwined in the mix, this also adds extra air to keep the batter light. A splash of vanilla gives this somewhat plain cake batter a mild floral essence, but the next ingredient is the star in this cake for the texture it lends to the crumb - sour cream! 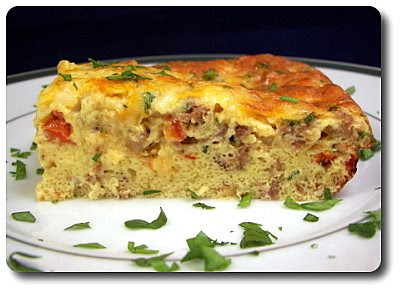 As with most cakes, quickbreads and muffins, once you start adding the dry ingredients, mix the batter lightly and just until the dry ingredients disappear into the wet. Once I poured half of the batter into one of our favorite bundt pans, I dotted the top with tiny spoonfuls of that ever-tempting chocolate-hazelnut spread, Nutella, to make a small ring inside. To reinforce the hazelnut backbone, we then scattered chopped toasted hazelnuts over that slick of Nutella. The rest of the pale cake batter was spooned on top, followed by plunging a thin knife into the center and gently swirling to remove any locked air bubbles and slightly moving that chocolate/nut combo around. I did have one accident at this point... apparently I wasn't paying attention as I was working that knife around because a split second later the bundt pan went from the counter onto the floor! I have no idea how I managed that one, but thankfully it landed right side up and only sloshed the batter around slightly... whew - crises narrowly averted! Jeff and the pups missed this adventure, though they came when they heard the noise - the pups would have loved to find a splatter of cake batter to clean up and I'm sure Jeff would have had the camera at the ready to capture it. Oh darn! Chocolate ganache poured all over the top, while being encouraged to dribble down the edges, might be a fancy way to finish the baked cake off if you felt the need to be especially indulgent, but just a shower of confectioners' sugar was plenty enough for us. I liked how this cake almost had a crustier exterior than you would find with a layer cake, yet still yielded to an exceptionally moist crumb inside from the hefty amount of that tangy sour cream! I thought it was interesting how Jeff and I ate our slices... Jeff went right for the kill and gobbled down the sweet chocolate center first for instant gratification. I, however, ate all of the buttery cake first and left that Nutella swirl for my final bite. While the Nutella somewhat scented the crumbs around the center, eating around it gave me a nutty, rich jackpot to savor and linger on my tongue for an intense final bite to remember! Woo! It's Friday already... and that means we've already arrived at another pizza night around here! 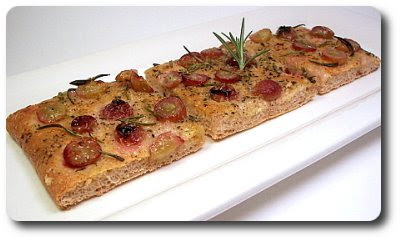 Tonight's dish is a little different and may not exactly be considered a pizza, per se, but this Grape and Rosemary Focaccia was brilliant for how simple it was and it used our favorite whole-wheat pizza dough. Unlike the crusts that are on the thinner side for our pizzas you typically find here, this focaccia needs a thicker base with extra rising time. When we stretch out our dough for other pizza recipes, they can be topped immediately (or pre-baked if need be) and go into the oven without wait. In this recipe, once I finessed the dough into a rough rectangle, I swept it off the counter and set it on a baking sheet to rise in a warm place (the cabinet directly above our refrigerator!) until it had started to look puffy. To give the dough a golden tone and touch of richness, I smeared olive oil over every nook and cranny I could find, which also left the dough tacky enough to accept a couple seasonings. 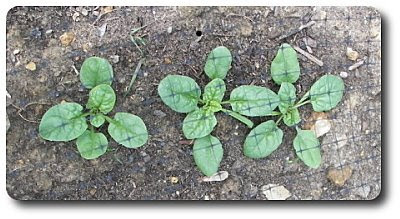 Dried basil (which you must crush in your fingers first to release its fragrance!) was sprinkled on first, then came a few pinches of coarse salt. Halves of juicy red grapes were maniacally strewn over the squishy dough, which opened the door for us us to add the remaining two ingredients - fresh rosemary and just enough fresh grated Romano cheese for a sharp contrast. Once in the oven and you've set your timer, you may want to take a quick peek a couple minutes before it goes off to see how it's coming along. Because the grapes have quite a bit of sugar in them, they will begin to caramelize and you don't want them to darken too much. When the focaccia is done, the crust will have become shiny and golden, with the roasted grapes on top becoming soft and even more juicy. Right as we took this out of the oven, a bit of decadence was added by drizzling on a favorite extra-virgin olive oil for a lovely fruity finish. 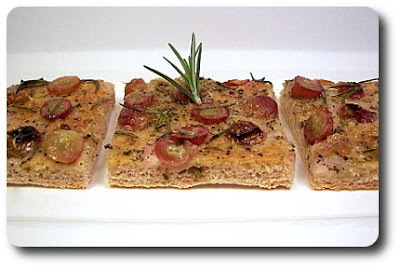 The aromatic punch of the rosemary on this focaccia was enough to seduce anyone in a close radius to come give this curious dish a try. Remember that oil we covered the dough to begin with? 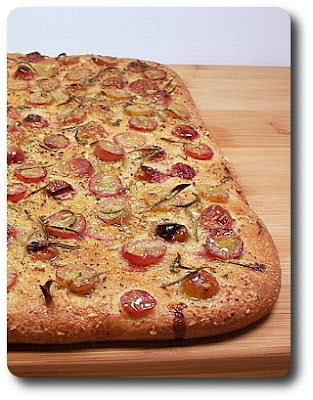 This gave the focaccia a crispness to its exterior, yet left the inside soft with a welcome chew to it. With plenty of intensified sweetness in the grapes to offset the salty bite on the crust, this was such a fine way to start off our weekend with a delicious meal. While I would definitely make this again just for us to have, I know I'll keep this recipe handy to serve as a swanky appetizer when we happen to have guests in the house! The meal that we had this evening was/is one of those dishes that could be prepared for breakfast, lunch or as we did, for dinner without thinking twice if it would work or not. 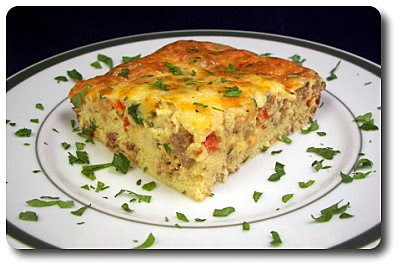 While that's good and all, the best part for me was the fact that we typically have all the ingredients on hand for this Baked Gruyère and Sausage Omelet, minus the red bell pepper of course that I had to pick up from the market. I usually have some chopped in the freezer ready to go, but I ran out earlier in the week! The layering begins in this dish by softening that pepper with a diced onion, then adding in a couple links worth of hot Italian turkey sausage. Stirring to crumble the meat as it cooked, we worked this in the skillet until the sausage had cooked through and begun to take on a little color. Using the hot Italian variety gave us a minimal tingle of spice, but certainly swap that for a milder sweet sausage if you like. Be sure to give this sausage and vegetable combo a few minutes to cool down before you jump to this next part. To fulfill the omelet portion, we do need to get a few eggs mixed up! I split the whole eggs with a few egg whites just out of habit - if you want to use completely whole eggs, drop out the whites and add two additional eggs. To loosen those viscous eggs up, we stirred in a touch of milk, then seasoned the bowl with salt, crushed red pepper for kick and a few grains of fresh ground black pepper. Shreds of Gruyère cheese were stirred in for a rich, nutty counterpoint, along with the crumbled sausage mixture and chopped parsley to freshen it up. Once poured into the baking dish, we scattered over more of that fancy cheese for a smashing note on top. Doneness will vary on your oven, but you are looking for the center to be just set and the top to be golden. If you don't trust your vision, you can slide a thin knife right into the center and see if it comes out mostly clean or excessively moist (and then you'll slide it back in and let it go an extra few minutes). A little wetness is ok though, as the heat from the dish will continue to radiate through and finishing cooking the center. 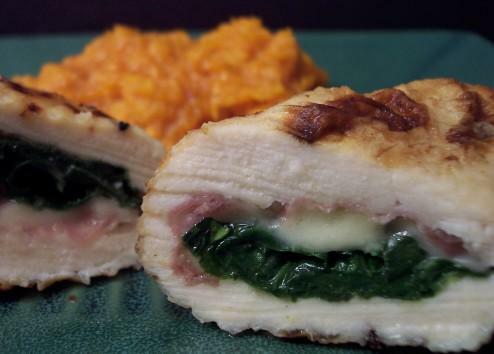 With most of the time needed to make this was just waiting for the oven to do its job, this dish was a pretty snazzy way to whip up a quick, tasty meal. The Gruyère made this feel more elegant and special, but this also comes at a price and makes it not as practical to prepare it on a whim - I imagine using a less expensive Swiss would work well enough if you wanted to trim down the cost. I thought working cherry tomatoes in would be a way to add variety, but Jeff thought this was ideal as is and suggested we leave well enough alone! 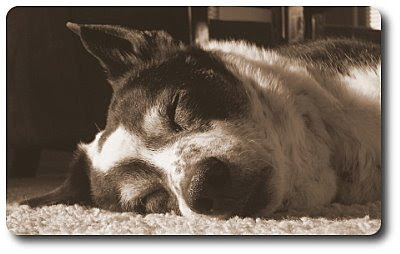 I can't believe the time has passed already - one year ago today, our old buddy Spike crossed over. He is still in our minds daily, thinking about how his quirky ways made our lives better and the undeniable loyal love he gave us. You will always have a special place in our hearts and we will never forget you! On a somewhat lighter note, how about we quickly move back into the food world? I took a recipe that was probably intended to be more of a side dish and added some chopped grilled chicken for a bit of protein for dinner tonight. 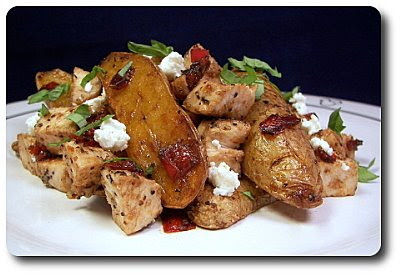 What we ended up preparing was this Roasted Potato, Garlic and Red Pepper Salad with Grilled Chicken that we decided worked well as a main dish... at least for us! 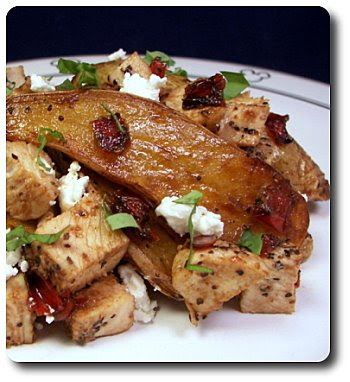 We tossed slender halved pieces of fingerling potatoes and a chopped red bell pepper with enough oil to coat, along with the must-have salt and fresh ground black pepper to develop their inherent flavors. The garlic was roasted along side those vegetables, but we singled out the unpeeled cloves and wrapped them in foil for a bit of protection against the heat - separating them into individual cloves also has the benefit of speeding up their cook time. I would suggest keeping an eye on the peppers - about 5 minutes before the potatoes were tender enough to call them done, the peppers were plenty done and much longer would have taken them too far. 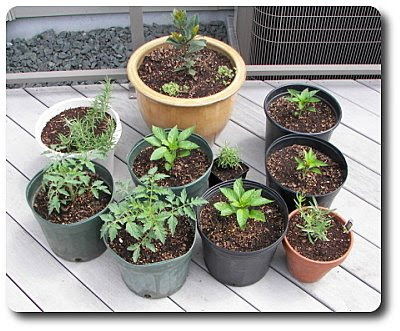 You may even want to opt for dicing them a bit larger so you don't have to worry about them getting too done. As soon as we pulled the pan out, we doused the potatoes with balsamic vinegar and since the potatoes were pipping hot, the tangy liquid was soaked right up. The garlic was done at the same time, so as soon as the cloves were cool enough to handle, we squished them out from their protective skin and mashed 'em together with more of that vinegar and a little oil to smooth it out. The potatoes, peppers and a couple cups of chopped chicken that I grilled were then tossed with that mellow garlic mixture. Just before we were ready to eat, we freshened up the salad by tossing shreds of fresh basil (which sadly didn't come from the backyard... that will change soon though, as the plants are finally starting to take off!) and crumbles of creamy goat cheese on top. This was quite the pleasing combination and we found roasting the potatoes added such depth that you just couldn't achieve by boiling them. Bulking the salad up with the chopped chicken definitely aided in bringing a more hearty nature, but I know we would have enjoyed this just as much if we left it out and served this as a side dish instead. The one thing I thought this lacked was a contrasting texture - everything was on the softer side, but I bet tossing on some toasted nuts (pine nuts especially!) would fix that, along with boosting its overall appeal. We went dark and dangerous for the Weekly Wednesday Treat Day that we've been doing for the past 3 1/2 years at whatever office Jeff is located in. Even though we went the chocolate route last week, Jeff apparently had a wicked craving this week and asked for another chocolate treat. I'm glad he asked though as I've been waiting for the right time try out these Dark Chocolate Cookies with Espresso! 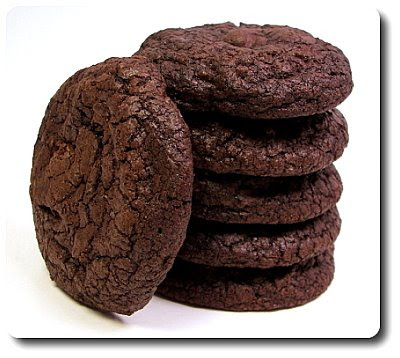 There is melted chocolate used in these cookies, but you won't want it really warm when you add it into the batter. Before you get too far ahead, melt the chocolate needed first and leave it off to the side. When it is time to add it in, it will have cooled down enough so the half-prepared batter won't be sitting there waiting for you to try and take the warm edge off the chocolate! These beauties have chocolate added in three forms - smooth Dutch-process cocoa in the dry ingredients, the melted bittersweet chocolate in the wet and finally a bunch of chunky bittersweet pieces folded in at the last minute. Using a knife works fine, but I like using a chocolate chipper to get uneven lumps without too much dust. You could certainly use chips if you like, but whacking away at good-quality bar or block of chocolate to get those hefty pieces adds to the appeal of these cookies, and also leaves you with a few tasty little shards for the baker to enjoy! I used a tablespoon cookie scoop to divvy the dough out - because we wanted the cookies to be fairly substantial, I was generous with scooping and made sure each was heaping, which ended up being roughly two tablespoons worth. 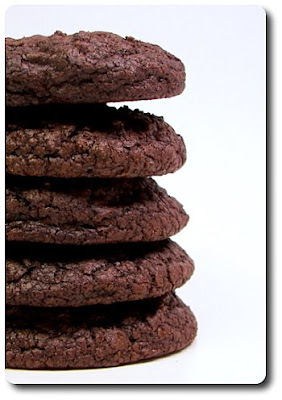 As with most chocolate cookies, doneness can be a little hard to tell as the color isn't as apparent as it is when you are baking lighter cookies. I tend to go by nose and when it smells that outrageous chocolate aroma start to pour out of the oven, I'll take the cookies out. This ended up being when the edges were firm to the touch and the center was almost set - this gave us cookies that were somewhat crispy, yet still moist with a pleasant chew. If you are looking for cookies that are more crunchy, try leaving them in an extra minute or two. 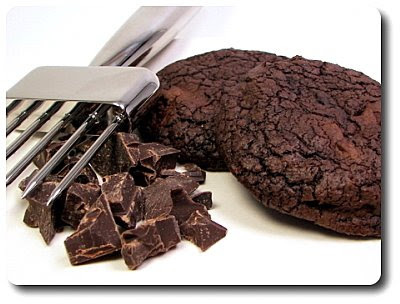 Intense, rich and unlike other recipes where you just use a pinch of espresso to boost the chocolate notes, this cookie, with it's more adult caffeine zing, is laced with enough so you are not mistaken right from the get-go what these are all about. Since these were on the larger side with a decent thickness, one was plenty to calm Jeff's chocolate cookie monster noises. However, I think you could get away with making these a little smaller, allowing you a greater yield without losing out on the experience. We'll catch up on today's food another time, but we thought we would take a moment and post an update with pictures of what we've been up to in the backyard and whatnot. Jeff took the camera out and about to take some snaps while I was working on dinner. Remember when I told you we spent a weekend planting over 400 strawberry plants? Since then, we've given them a protective covering (we cut those darn birds off before they even thought about swooping in!) 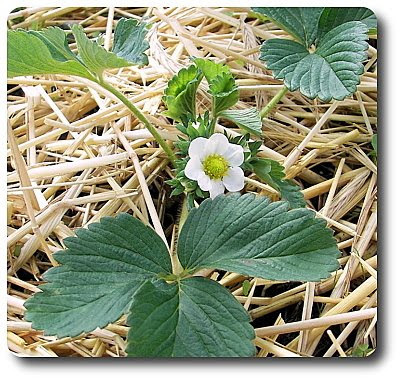 and scattered a mess of straw through the beds to lift the (hopeful) berries off the ground to keep them away from disease or rotting. It seems they like their new home - the plants have greened up well and have started opening their dainty flowers! 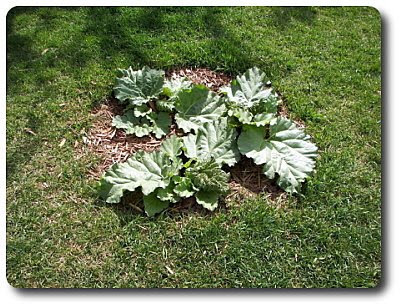 We thought the area around the rhubarb looked pretty sad, so we decided to spruce it up. 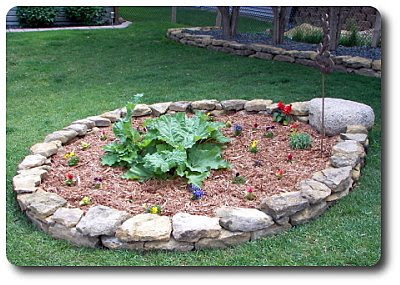 After digging out a circle of sod around it, we enriched the soil and planted a variety of flowers for a colorful array. We had a ton of these stones (unsure what exactly they are?) 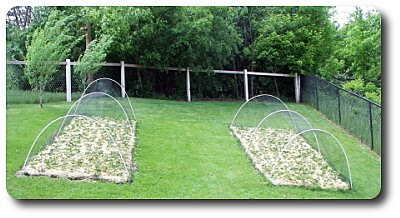 and thought we would use them as a border, then covered the exposed areas in between the plants with cedar mulch. 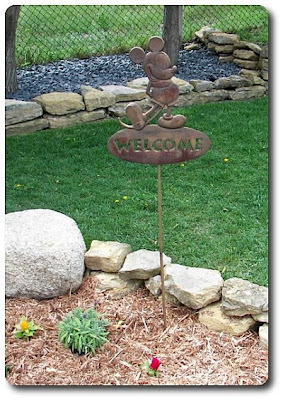 And yes, if you spy a Disney related item in the area, I bet you can guess where that came from... Mr. Mickey Obsessed himself got that awhile ago and has been itchin' for an area to plunk it down. are doing their thing. 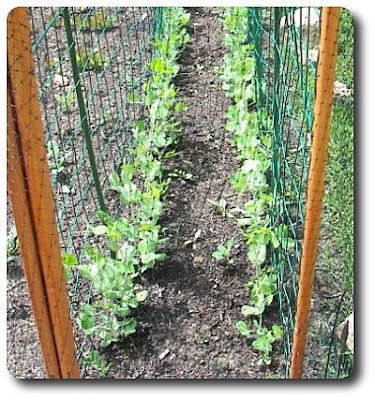 The birds did some damage while they were sprouting, but once we covered that area with netting, the plants started to take off. We also have tomatoes, peppers and a variety of herbs scattered all over - some in the garden and a few in pots right now... we'll see what happens as the summer mulls on! Since Jeff had today off, we thought we would take a trip to one of the local parks and go for a walk with the pup! 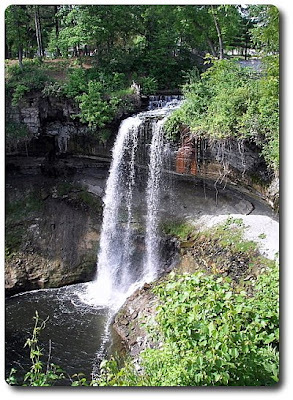 We ended up at Minnehaha Falls, which is such a nice place to stroll around and see the sites. What, didn't you know we had waterfalls in Minnesota? Okay, so it may not be one of those glorious ones you would find in say, Hawaii, but it is still beautiful and inspiring! 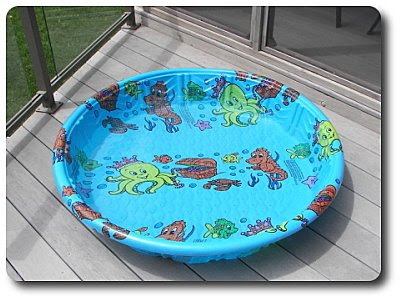 Oh, and before we go for today, I forgot to tell you we got a pool! Yeah! Too bad it's not for us *sigh*. 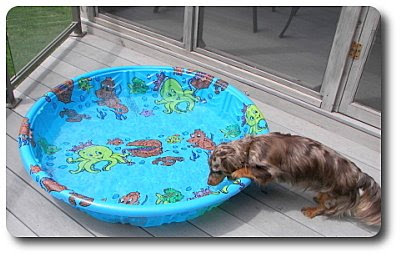 I'm sure some will scoff, but I was convinced by you-know-who, that Gus and Max would be the happiest pups in the world if they got a little tub to splash around in. 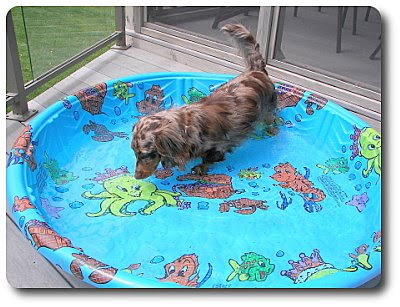 I gave in and we stopped to pick up a kiddie pool on the way home - I know, I know... but at least it was only $6! But then he jumped in and waddled around - I think he looks at it as a giant water bowl right now! He blew some bubbles with his nose, pawed at the water and then drank way more than he should have. This should be interesting! 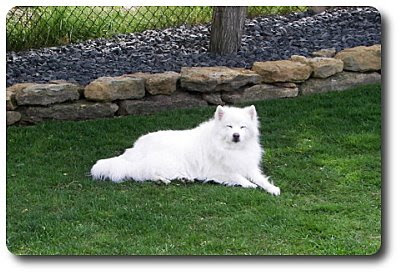 Max took a look and decided he would be more comfortable in the shade instead... ha! 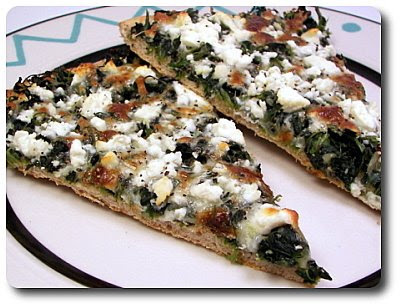 Over the past week, we prepared about 6 new recipes - of those, our favorites had to be those Beef and Potato Burritos, the fun Bittersweet Peanut Butter Krispie Surprise Balls and that Spinach-Feta Greek Pizza from our weekly Friday Night Pizza. Has it been awhile since you've picked up a whole chicken at the market? It had been for us, as lately it has just been easier to pick up the parts we wanted or needed to get the job done. 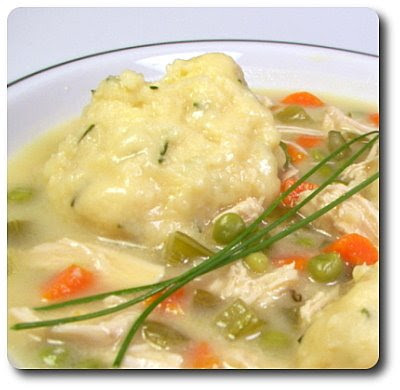 Tonight's dinner, Chicken and Dumplings, reminded me why it's worth picking up a whole chicken and really put it to work. Because this is a "from scratch" recipe, we needed to get dinner going quite a bit earlier than normal by making a batch of homemade stock with that chicken. Simply the cleaned bird, a couple bay leaves (from our Bay Laurel tree Mom gave us to grow! ), a few sprigs of fresh time, peppercorns, a head of split garlic, salt and enough water to completely cover is all that's needed for this homemade stock. Left to simmer until the chicken is meltingly tender, be sure to take the extra time to skim the scum and fat off the surface often while this bubbles away in the pot. When the chicken had given itself to the liquid, we removed it and set it aside to cool down while we strained out the leftover solids in the broth. Not because I've ever done this (*rolls eyes*), but don't forget to put a container underneath your strainer so you don't cry as you watch the stock trickle down the drain. When the chicken had cooled down enough, we tore into in, shredding the meat as we went, and set it aside to be added back later. To get the base of the sauce together, butter was melted with a couple glugs of olive oil to begin softening diced carrots and celery with a minced garlic and a couple more of those bay leaves. To give the sauce some thickness later on, flour is stirred into the mix to begin a very light roux - once in, stir the flour around the pot for just a couple minutes to cook out the starchy taste, but don't go more than that as you are not looking for it to take on color. That homemade stock you've already prepared is finally gradually whisked in, along with chunky pearl onions and peas. Once it has simmered enough to begin to thicken, just a touch of richness is added by drizzling in heavy cream. I wouldn't suggest swapping this out for a lighter product as its creaminess is needed... it ends up being less than a tablespoon per serving! If you're worried about having leftovers of that cream, freeze it in tablespoon portions - it won't make whipped cream any more, but it works just fine for sauces or whatnot. While the sauce was finishing up, there one was last thing we needed to make - the buttermilk-chive dumplings! You'll notice we call for "about 1 cup" of the buttermilk - when you mix the ingredients together, start out with 3/4 cup worth and check the texture. Since flour isn't reliable with how much liquid it needs, hold back and if it seems too dry, add in enough of remaining buttermilk to get to a point where the batter is not dry, but is still fairly thick. When the above sauce was ready and the shredded chicken was folded in to warm through, the dumplings were portioned out into the pot to cook through. The original recipe said the dumplings shouldn't be crowded, but the batter makes a fair amount and ours did end up filling in every inch of our pot when it had all been added. Maybe our pot was on the smaller side? It didn't matter though, by covering the pan, it trapped in the moisture and heat so that the dumplings still puffed and cooked evenly. Whew - that was a bit drawn out huh? Didn't I mention this dish was going to take some time? Thankfully we picked a Sunday to make it! 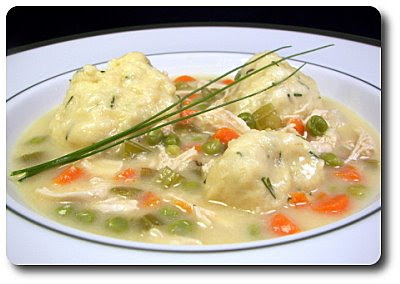 Between the meaty shreds of chicken, generous vegetables and creamy sauce, adding those tender, light dumplings on top made for such a swoon-worthy dinner that was worthy of every minute it took. Jeff initially thumbed his nose up to those bulbous pearl onions when I tossed those in, adding one of those "I don't like it" claims and "I'll be picking those out, thanks" but guess what wasn't left behind?! Ha! Take that! You could prepare the stock and shred the chicken ahead of time if you wanted to give yourself a head start, which would help speed this along on the day you make it. Doing that would also give you a chance to stash the stock into the refrigerator, letting the fat rise up and solidify on the surface to scrape off before you use it. However, not doing that made for such an ultimate comfort food dish with quite the voluptuous sauce! When I went looking to see when the last time we made a batch of muffins was, I couldn't believe it had been over three months! I had to rectify that this morning with these Maple Raisin Bran Muffins, if for no other reason than to get some in the freezer for when we need a quick on-the-go snack! 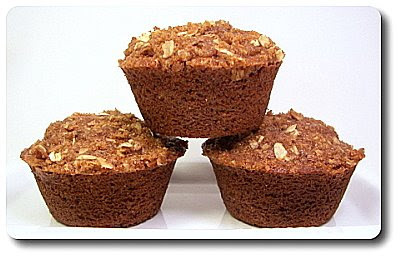 Packed with lots of good nutrition, the dry ingredients for these muffins include whole wheat pastry flour, oat bran, plump golden raisins and our favorite frisky Vietnamese cinnamon. 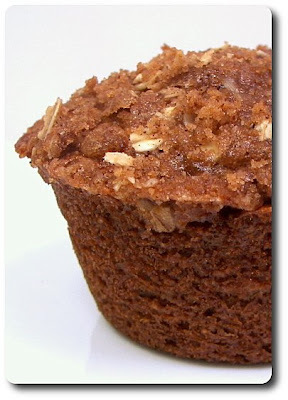 Using a mix of dark brown sugar and granulated sugar to sweeten the batter entwines a rich depth throughout the crumb, yet not so much that it felt like eating a cupcake. To moisten those ingredients, tangy sour cream, milk, just a few tablespoons of melted butter and a couple glugs of pure maple syrup are rounded out with a splash of vanilla and an egg. Because we wanted to accentuate the maple, we did add just a touch of maple extract for good measure. Once I filled up the muffin tin with batter (ice cream scoops are great for this! 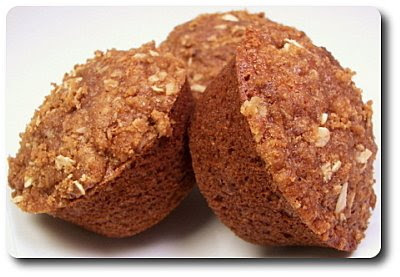 ), the muffins are topped off with another addition to draw you in even more. Dark brown sugar, oats, flour, just a half tablespoon of oil, more maple syrup and of course, a sprinkling of cinnamon, are tossed together until the ingredients are moistened. The recipe calls for quick oats, but I only keep the thicker old-fashioned in the pantry - to make your own, just take the same amount and either coarsely chop them with a knife (you only need a couple tablespoons worth) or make a bigger batch and blitz them once or twice in the food processor to break them down slightly. The original recipe did call for twice the amount of topping than what I used - you can certainly do that if you wish, but we pared it down to keep it more in line for us. To check and see if they are done, you can either slide a toothpick into the center and see if it comes out mostly clean (a few moist crumbs attached it perfect), or another way to check is to lightly press on the center and see if it bounces back. The latter isn't as desirable here because the sugar int he topping melts and makes for a crispier top. When you see they are ready, take them out and leave them in the pan to cool down slightly before taking them out. Five minutes is usually enough to cool down the pan and muffins enough that you are not burning your fingers to help pull them out. 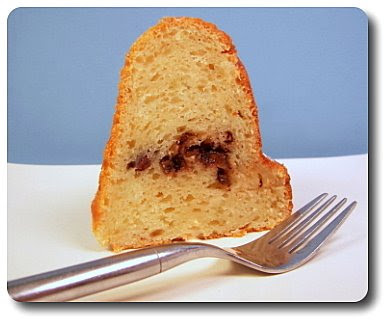 If the muffins stay too long in the wells, the bottoms start to steam, which may toughen the base! Imagine the flavor of a spicy oatmeal raisin cookie, yet with the lovely texture of a muffin - that's what Jeff and I both thought of as we were picking away at the leftover crumbs on our plates! I did expect them to be a bit more moist with the milk and sour cream, but that isn't to say they were dry or too dense either. The sour cream did work well to make for tender muffins, along with activating the baking soda to create those sweet crowns on top. I also thought the maple wasn't shouting as loud as it could have, so I did note to try and increase the maple extract slightly next time. Our weekly Friday Night Pizza that I made for dinner tonight was fairly lean on the ingredient list, but those few sure meant business! The first thing I needed to do, and I know this won't shock anyone, was get our our favorite whole-wheat pizza dough buzzed together in our food processor so it could be set off to rise. 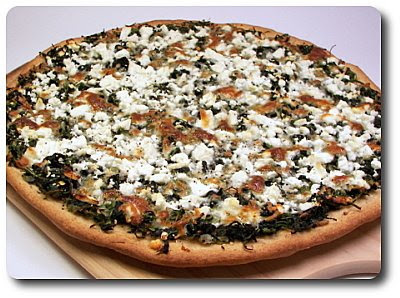 Once that was out of the way, the rest of this Spinach-Feta Greek Pizza was a breeze to throw together! Onions and garlic, added to a warmed skillet with oil, were left on the heat until the onions released their moisture and became tender. Two hearty bunches of fresh spinach, well-rinsed and trimmed, were then gradually stirred to the skillet, letting the heat wilt the leaves down to what seemed like nothing when compared to the volume we started with! 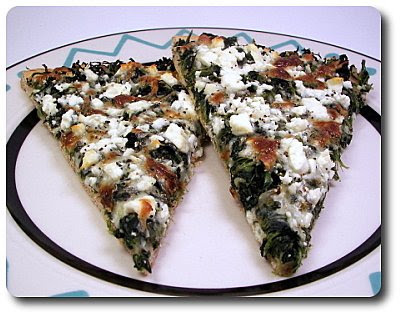 With all that spinach, you need not be stingy with the seasonings - we dusted the skillet with salt, black pepper and crushed red pepper to begin adding layers, but then used one more spice you may not think would work. That spice would be fresh grated nutmeg - this is lightly sprinkled in, but you won't want to add much. You don't want to taste it and think "Huh, why is there nutmeg in this?". Just the slightest touch (which also works well in white sauces) with spinach in a dish like this adds a unique flavor that one can't quite pick out, but makes your taste buds dance trying to guess. While that spinach topping was set aside to cool, I worked my fingers on the dough, gently stretching and pushing it around until it blossomed into a rough circle. I drizzled olive oil all around the top and again used my hands to smear it into all the crevices and dimples the dough had. Since the toppings are fairly moist and already cooked, I put the dough onto the stone and gave it a chance to toast up. Once the dough was a touch golden and beginning to crisp, we slid it out and arranged the wilted spinach mixture as evenly as I could. For the cheeses, we used a combo of shredded mozzarella and crumbles of salty feta. Baked once more, the pizza was ready when the toppings had heated through, the crust was crisp and the top had a few of those delicious browned spots on the cheese. The original recipe had a light salad of halved cherry tomatoes, tossed with fresh oregano, scattered on top of the fully cooked pizza, but the tomatoes didn't look too healthy at the market and we decided to forgo them. I'm sure that fresh burst would have been a nice contrast to this healthy vegetable pizza, but we were very pleased and happily stuffed with this as is. If you happen to be a fan of olives, they might just the spiffy ticket to dress up the top and add to the Greek theme! 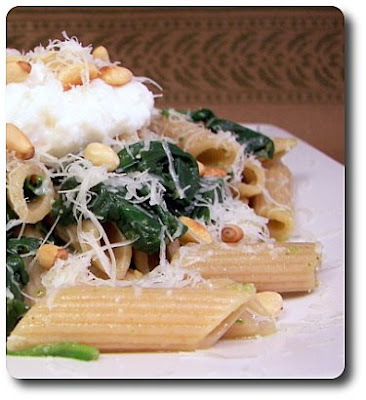 I still had some pine nuts left after using a handful in that Browned Butter Gnocchi dish last week and I thought this Penne with Ricotta and Pine Nuts sounded like a good plan to make for dinner tonight. I did make quite a few changes to this recipe though as it read a little light on the seasonings to me when I was going over it. While I was waiting on the whole-wheat pasta to cook, I took the olive oil called for in the original recipe and heated it with minced garlic to give it a boost. When the garlic had mellowed out, off heat I stirred in a few spoonfuls of thawed pesto I had languishing in the freezer to get them used up. By the time I was done with that, the pasta had just a couple minutes left until it was ready and that's when we added a mess of baby spinach to quickly wilt down. Once drained, we dropped the pasta and spinach back into the same pot and stirred in that garlic-y, pesto infused warm olive oil. There was enough dressing to coat the pasta for us, but if you like your pasta a bit more saucy, hold back some of the starchy cooking liquid before you drain it off the pasta and use that to thin out the oil mixture. Give it a quick taste right away and season with a little extra salt and pepper if needed - our pesto was already seasoned well, but I felt it still needed a touch to highlight the lighter notes. In the time it took for me to place a skillet into the sink, Jeff had already swiped his plate from the kitchen island and was about to dive right in! "Hey, not yet - I'm not done!!" is the only thing I could manage to say. It would have probably been fine as is, but I still had a couple of important elements to work in! 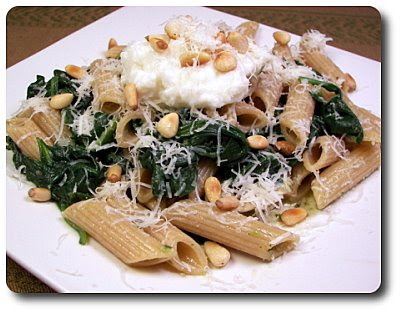 A dollop of smooth ricotta cheese, strewn with flecks of crushed red pepper for kick, was placed in the center of the pasta, along with a shower of Parmesan and those buttery toasted pine nuts for crunch. I wasn't sure about that ricotta dollop in the center, but I found myself rather enjoying being able to take what I wanted from that creamy spot with each forkful, rather than having it tossed with the pasta! Ready with very little prep, I was very happy that we went ahead with the added garlic and pesto! I don't think this dish would have necessary been bland without those changes, but Jeff and I felt that it helped round out the simpler flavors with a slightly more complex edge. Bittersweet Treats with a surprise! 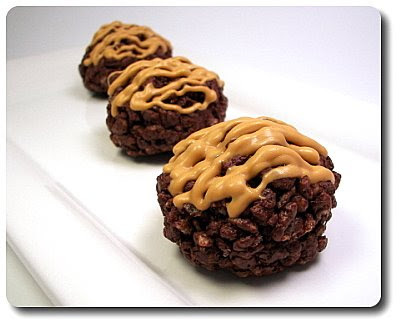 Chocolate became front and center again for the Weekly Wednesday Treat Day with these Bittersweet Peanut Butter Krispie Surprise Balls. The title doesn't exactly flow off the tongue, but hey, it tells you what it is! 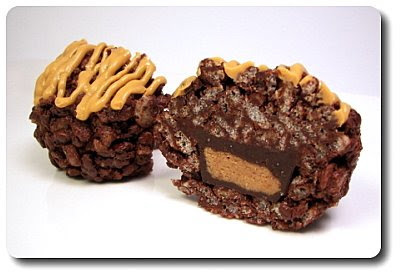 These babies take Rice Krispie Treats to a whole new, dark chocolate level that we think is not to be missed. You'll find your typical ingredients - butter, the cereal and marshmallow - but they are slightly tweaked to give them an edge. I used unsalted butter, but then gave the mix a hefty pinch of salt to slice through some of the excess sweetness that is inherently in this type of treat. When the butter had liquefied, rather than tossing in whole, chunky marshmallows to melt down, we used our creamy pantry friend Marshmallow Fluff! Also at this point went in a hefty amount of chopped bittersweet chocolate. When the chocolate had smoothed out, in went the mound of rice cereal to be tossed around the pan until each piece had a chance to be in contact with the gooey, chocolate marshmallow pool. Scooped out portions (a tablespoon cookie scoop is great for this!) of the cereal were then placed into individual wells of a regular muffin tin that I lined with paper liners to make clean up a breeze. 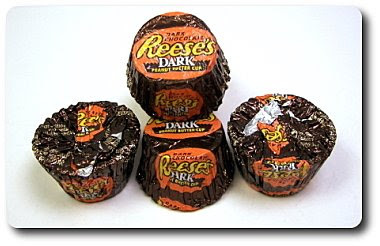 When twenty four cups had been filled, we pulled out our secret surprise - miniature dark chocolate Reese's peanut butter cups! I didn't know these actually came in dark chocolate, but when Jeff saw them at the market this weekend, they were in the cart before I had a chance to say anything! Once we set the peanut butter cups on top of that bottom cereal layer, another scoop was placed over the top to hide the candy inside. As if these weren't crazy enough, a drizzle of melted butterscotch chips were added on top for a contrasting jolt to shake up the treats with a little pizazz. You could, of course, use peanut butter chips, more bittersweet chocolate or even white chocolate, depending how you want to dress theses up! 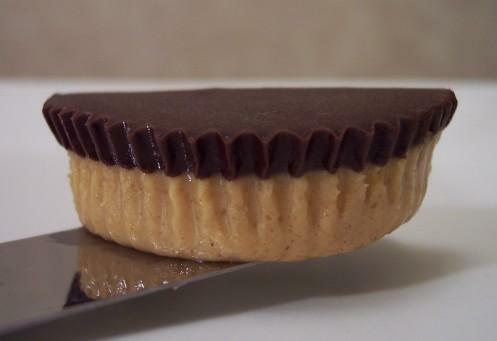 If peanut butter cups don't tickle your fancy (and if they don't, why not?! 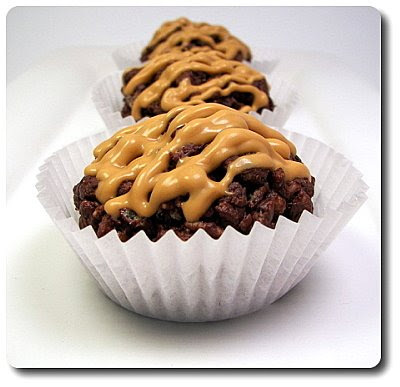 ), how about trying a small candy like Rolo's for a caramel version or even those flavored chocolate Kisses to change up the surprise? I can see many variations of these in our future, especially when the bake sale season starts up and we need a different type of treat to bring! In a large skillet, heat 1 tablespoon oil over medium. Add chopped leek - cook, stirring often, until leek just begins to soften, about 4 minutes. Stir apple, thyme, 1/2 teaspoon salt and 1/4 teaspoon pepper. Cook, stirring occasionally, until the apple begins to soften, about 2 minutes. Remove from the heat and scoop mixture into a bowl to cool - wipe out the pan and set aside. Place tenderloin on cutting board and butterfly by slicing lengthwise through the center of the meat, stopping just short of the opposite edge. Open the halves of the pork and lay a sheet of plastic wrap on top. Pound pork until it is evenly 1/4" thick. Spread cooled apple mixture down the center of the pork, making sure to leave a clean 1" border around the edges. Fold in about 1" of the two short ends of the pork - then roll it up, jelly roll style, starting on one long side, to enclose the filling. Tie kitchen string firmly lengthwise around the roast to secure the two ends. Use the string to then tie it crosswise at 2" intervals. Brush pork with 1 teaspoon oil, then season with remaining salt and pepper. Heat remaining tablespoon oil in the same skillet used above over medium-high heat. Place tenderloin into the skillet - reduce temperature down to medium and brown pork roast on all sides, about 4 minutes total. Transfer pork to a rimmed baking sheet coated with cooking spray. Place into the oven and roast until an instant-read thermometer registers 145 degrees, about 12 to 15 minutes. Remove from the oven and place pork on a clean cutting board to rest for 5 to 10 minutes (reserve any juices on the baking sheet for the sauce). Meanwhile, place skillet back over medium-high. Add applejack, whole thyme sprig and crushed garlic. Bring mixture to a boil and cook, stirring, for 1 minute. In a small bowl, whisk together cider and cornstarch. Whisk mixture into the skillet - bring back to a boil and cook, stirring occasionally, until thickened and reduced by just over half, about 8 to 10 minutes. Remove from the heat - remove thyme sprig and garlic. Whisk in mustard and any juice from the baking sheet. 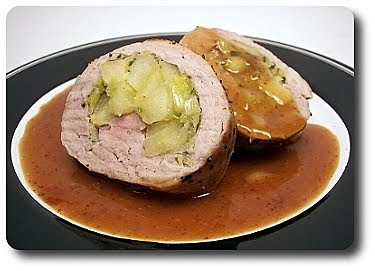 Slice pork and serve with the sauce. We have a fair amount of meatless meals around here and in fact, the last three recipes in a row we've posted about were that way! It's not for any particular reason, but we've just grown to end up gravitating that way in the past few years. Saying that, there are still nights around here where nothing but meat and potatoes sounds good enough to satisfy our bellies. 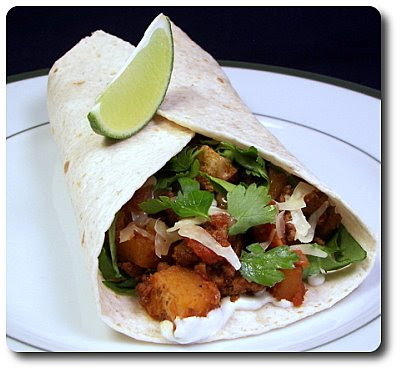 Tonight was one of those times and to quell that rumbling, we thought these Beef and Potato Burritos would do the job and be a little out of the ordinary. To get these burritos going, we slid a diced russet potato into a skillet lined with enough oil to turn their edges a rich golden brown. The cubes won't be fully tender yet, but to keep things moving along, we slid the potatoes to one side and added lean ground sirloin, a chopped onion and a finely chopped jalapeño into the skillet. Crumbling the meat as it cooked, it took just a few minutes for the onions to soften and the beef to cook through - it is fine if the potatoes get mixed in during this process, but don't be too rough and end up smashing them to bits. Juicy fire-roasted diced tomatoes, cumin and paprika were then thrown into the mix to add moisture and help finish cooking the potatoes through. Let this bubble away until most of the liquid from the tomatoes has concentrate down, leaving you with a thick, meaty filling that aches to meet its tortilla blanket. To make the large tortillas a bit more flexible, each one went into a heated dry skillet until they had warmed through and taken on just a hint of color. To assemble these monsters, we first smeared the bottom of the tortillas with sour cream, followed by shreds of crisp fresh romaine, the beefy potato filling, mild Monterey Jack cheese, fresh cilantro and one of the magic ingredients, fresh lime juice! Because these are stuffed pretty full, you'll want to leave one end open, otherwise it will most likely be a tough fit to get the filling completely enclosed. Besides, it makes them a bit more attractive with one end open than just a bulging hunk of tortilla on your plate! 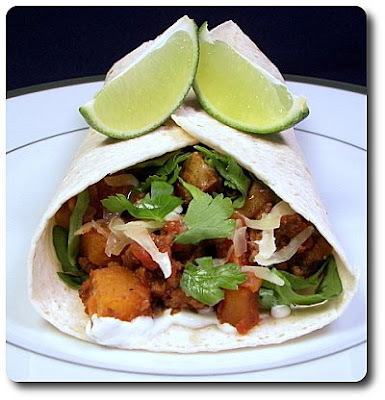 The tender potato cubes may be a little unexpected in a burrito, but using it as a starch, rather than rice, was such a fun (and inexpensive!) way to bulk up the filling. We both commented how the smokiness from the cumin and roasted tomato worked in such a good way to highlight the meat and potatoes, while the lettuce and cilantro layers helped cut through the heaviness the filling brought. That squirt of lime at the end is also an absolute must-have - bright, tangy and adds just the right zip to round out the filling. Time for more pup treats!